PRP is made from your own blood, and includes just the skin-loving components. Blood is mainly made up of liquid. What is inside is like liquid gold because it contains valuable solid components such as growth factors, stem cells, plasma protein, and platelets. The platelets are what causes the blood to clot when you get a cut – and it helps the healing process. Platelets are also what helps people skin look gorgeous after having a Vampire Facelift. The growth factors in the platelets help heal damaged skin. PRP is not just platelets – it’s plasma with a concentration of platelets. There’s 5 to 10 times greater amount of platelets in plasma. The way we get this plasma is by separating the blood cells from the blood with centrifugation. The output from centrifugation is simply the high concentration of platelet plasma. The process is quite simple. We start applying numbing cream to the face. This helps keep clients comfortable and prevents bleeding. After drawing blood, we spin the blood in a centrifuge to isolate the beneficial platelets and plasma that we need. To begin, a medical-grade microneedling device is passed over the face. This creates micro punctures in the skin to prepare it to receive the PRP solution. Hyaluronic acid is sometimes brushed over the face or injected into deep wrinkles. This highly effective solution hydrates and improves the look of skin. The last part involves applying the PRP solution and injections. 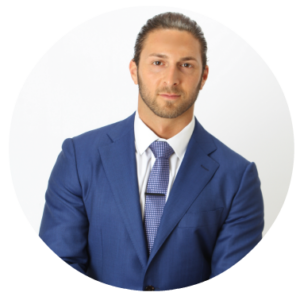 James Christian Sardelli, RPA-C will administer the plasma all over the face focusing on the areas where fine lines and wrinkles appear. PRP and hA injections can also treat undereye bags, soften acne scars, and reduce the size of pores. Results are seen about a week after the appointment. The face will be red and dry for the first three days, but as it heals, you will soon see the amazing effects of the treatment. By the end of 12 weeks, the skin will be smooth, soft, and nearly flawless. Clients are always so impressed with the results that they wonder when they can have the treatment again. Results last for one full year, so many clients make the Vampire Facelift an annual tradition of rejuvenating their skin. James Christian Cosmetics is the preferred aesthetic center for Vampire Facelift in Manhattan and Long Island. Make your appointment today! Our Cosmetic Concierge line is open 24/7 and is available by phone or text at 917-860-3113. Our offices are located throughout Nassau and Suffolk counties including Manhattan, Commack (flagship offices), Islip, Westhampton Beach, Rockville Centre, Farmingdale, and Babylon Village, NY.